Citrus Connection is the Community Transportation Coordinator (CTC) for Polk County. This special program provides subsidized or reduced-price bus passes. We also provide door-to-door service to physically, mentally, emotionally or economically disadvantaged individuals. Call 855-POLKBUS (765-5287) to qualify. In compliance with the Transportation Disadvantaged Service Plan (TDSP), Citrus Connection Paratransit is our call ahead, door-to-door service for those who are unable to use our regular service. This specialized fleet of small, wheelchair lift-equipped buses is currently available to senior citizens, disadvantaged citizens and citizens with disabilities throughout Polk County. The cost of these services is a one-way fare of $2, or co-pay as low as $2. Once the qualification process is approved, requests for transportation can be made in advance at 863-534-5500. (TD requests for service may be subject to service availability). For more information or to see if you qualify for Paratransit service, download the application form at ridecitrus.com, or give us a call at 863-534-5500. 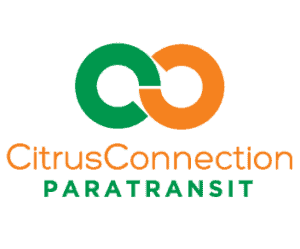 Paratransit service operated by Citrus Connection provides transportation throughout the FIXED Route Service Area and beyond and is available for persons with disabilities who are unable to ride the fixed route buses. ADA/Paratransit is a shared ride service providing transportation throughout our area. There are no restrictions on the purpose or number of ADA service trips you may take, except that you share the ride with others traveling at the same time in the same direction. Every bus carries ADA certified lift-equipment and our operators are available to provide boarding assistance. A one-way fare is $2. Out of Town Visitors with current ADA eligibility can access our ADA Service temporarily for 21 days within a 365-day period. For more information or to see if you qualify for paratransit service, download the application form, or give us a call at 863-534-5500. Citrus Connection is the Community Transportation Coordinator (CTC). This special program provides free or reduced-price bus passes to physically, mentally, emotionally or economically disadvantaged individuals. The Transportation Disadvantaged Program is a coordinated state-wide effort which groups riders together for a shared ride service. Transportation services are available in all 67 Florida counties for those who are eligible and have no access to transportation. Federal, State and Local agencies join together to provide necessary transportation to medical appointments, employment, educational and other life sustaining services. Learn more about Your Community Transportation System. For more information and to see if you qualify, call 863-534-5500. See the results of our Customer Satisfaction Survey. Every Citrus Connection bus is wheelchair lift-equipped, and all of the regular route buses are also equipped with “kneelers,” which lower the front step of the bus and make it easier to board. If you are unable to use our regular service, paratransit service is also available. 855-POLKBUS (765-5287). Paratransit operates six (6) days a week and its hours are comparable to fixed route service. Paratransit reservations are taken from 8 AM to 5 PM weekdays and Saturday 8 AM to 4 PM. There is no ADA service on Sundays or on the following holidays: New Year’s Day, Martin Luther King Day, Memorial Day, Independence Day, Labor Day, Veterans Day, Thanksgiving and Christmas. One way fare on Paratransit is $2. You MUST have a previously purchased bus pass for travel as Paratransit DOES NOT ACCEPT ANY CASH on board the bus. Paratransit bus passes are available as single-use pass or multi-ride pass for your convenience. Passes may be purchased with cash, money order, debit or charge cards at the offices, by phone, by mail or online. An approved Personal Care Attendant (PCA) rides for free. The need for a PCA must be indicated on your application for ADA services and is subject to approval. One companion may travel with you if requested at time of scheduling and when there is availability of space. The companion’s fee will also be $2 each way and must be paid for with a pre-purchased pass. Citrus Connection has adopted a new ADA Paratransit Passenger No-Show policy in an effort to bring our riders more efficient paratransit service, and to be up-to-date with the Federal Transit Administration best practices, and with community input. No-shows are recorded each time a paratransit passenger makes a late cancellation, forgets to cancel, declines their trip at the door, or is not available for pick-up for their scheduled trip. Cancellations are accepted as late as one hour before the scheduled trip. Cancellations made less than one hour before a scheduled trip are considered a no-show. 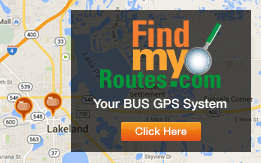 Passengers may call Regional Mobility Call Center @ 855-POLKBUS (765-5287) to cancel a trip. No-show/late cancellations represent 10 percent (10%) or more of their scheduled trips and the rider has four (4) or more no-shows in a calendar month this will result in a violation and will increase each month that the passenger exceeds the no-show threshold. 1st violation – Passenger will receive communication alerting them of the no-show/late cancellation. Passengers will be notified of every no-show; passengers will receive written notification starting with the second no-show. Passengers who wish to appeal an ADA suspension may download a form at www.ridecitrus.com or request a form be sent to them. Passengers with concerns about a No-Show are encouraged to call the Manager of the Regional Mobility Call Center at 863-534-5500. Passengers are not responsible for no-shows resulting from sudden illness, family or personal emergency, transit connection or appointment delay, extreme weather conditions, operator error, or other unforeseen reasons for which it’s not possible to call the Paratransit Dispatch line to cancel in time or take the trip as scheduled. If a passenger exceed the no-show threshold, they will receive a suspension letter, proposing to suspend service within one weeks and outlining the appeals process. For more information, or to see if you qualify for Paratransit service, download our application form or give us a call at 863-534-5500. Citrus Connection’s Paratransit es puerta a puerta, servicio de viaje compartido proporcionar transporte a través de nuestra área. No hay restricciones sobre el propósito o el número de viajes que puede tomar, salvo que usted comparte el viaje con otras personas que viajan en el mismo tiempo en la misma dirección. Cada autobús lleva ADA certificada elevación equipo y nuestros operadores están disponibles para proporcionar asistencia para el embarque. Paratransit cuenta con seis (6) días a la semana de 6:15 am a 6:15 pm entre semana y de 7:15 am a 4:15 pm los sábados. Paratransit reservas se toman de 8 pm a 5 pm entre semana y los sábados 8 a.m.-4 p.m… No hay servicio de ADA en domingo o en los siguientes días festivos: Día de Año Nuevo, Martin Luther King, Día de los Caídos, Día de la Independencia, Día del Trabajo, Día de los Veteranos, Día de Gracias y Navidad. El precio unidireccional de Paratransit es de $ 2. Usted debe tener un pase de autobús previamente adquirido para el viaje, Paratransit no se hace efectivo a bordo del autobús. Paratransit pases de autobús están disponibles como pase de un solo uso o multi-ride pase para su comodidad. Los pases se pueden comprar con tarjetas de dinero en efectivo, giro postal, débito o cargo en las oficinas, por teléfono, por correo o en línea. Un Asistente de Cuidado (PCA) paseos personales aprobados de forma gratuita. La necesidad de un PCA deberá indicar en su solicitud de servicios de ADA y está sujeta a aprobación. Una compañía puede viajar con usted si así lo solicita en el momento de la programación y cuando exista disponibilidad de espacio. Los visitantes de fuera de la ciudad con una elegibilidad actual del ADA pueden tener acceso a nuestro servicio de ADA temporalmente por 21 días dentro de un período de 365 días. La comisión de la compañía también será de $ 2 cada uno forma y debe ser pagado con un pase pre-comprado. Para obtener más información, o para ver si usted califica para el servicio de autobús es práctica, descargue nuestro formulario de solicitud o llámenos al 855-POLKBUS (765-5287). ADA ha adoptado una nueva política de ausencia de transito de pasajeros en un esfuerzo por traer de vuelta a nuestros pilotos más eficiente servicio de transito y de estar al día con la Administración Federal de Tránsito de las mejores prácticas, y con los aportes de la comunidad. Quando no aparecen se registran cada vez que un pasajero transito hace una cancelación tardía, se olvida de cancelar, disminuye su viaje en la puerta, o no está disponible para pick-up para su viaje programado. Las cancelaciones son aceptadas como tarde como una hora antes del viaje programado. Las cancelaciones realizadas con menos de una hora antes de un viaje programado son considerados no-show. Los pasajeros pueden llamar al Call Center de movilidad regional a 863-534-5500 para cancelar un viaje. N0-Mostrar policia decancelación tardía o de no-show representan el 10 por ciento (10%) o más de sus viajes programados y el ciclista tiene cuatro (4) o más no se presenta en un mes calendario esto tendrá como resultado una violación y aumentará cada mes que el pasajero excede el umbral de no-show. Primeira violación – El pasajero recibirá comunicación avisándole de la no-show o cancelación tardía. Los pasajeros serán notificados de cada no-show; los pasajeros recibirán notificación escrita a partir de la segunda no-show. Los pasajeros con preocupaciones acerca de No-Show son alentados a llamar al Gerente Regional del Centro de Llamadas de movilidad a 863-534-5500. Los pasajeros que deseen apelar una suspensión de Ada puede descargar un formulario @ www.ridecitrus.com o solicite un formulario sea enviado a ellos. Más allá de la ausencia de un control del Pasajero los pasajeros no son responsables de ninguna de la muestra resultante de enfermedad repentina, emergencias familiares o personales, conexión de tránsito o nombramiento demora, condiciones meteorológicas extremas, errores del operador, u otras razones imprevistas para los cuales no es posible llamar a la línea de despacho Paratransit para cancelar en tiempo o hacer el viaje como estaba previsto. Los pasajeros pueden llamar al Call Center de movilidad regional a 863-534-5500 para cancelar un viaje suspensions si un pasajero exceda el umbral de no-show, recibirán una carta de suspensión, proponiendo para suspender el servicio dentro de una semanas y esbozar el proceso de apelación. Para más información o para ver si calificas para Paratransit Service, descargue nuestro formulario de solicitud o llámenos al 863-534-5500. Citrus Connection is committed to facilitating the accessibility and usability of its Website, ridecitrus.com, for all people with disabilities. If you use assistive technology (such as a Braille reader, a screen reader, or TTY) and the format of any material on this website interferes with your ability to access information, please contact us. If you do encounter an accessibility issue, please be sure to specify the Web page in your email, and we will make all reasonable efforts to make the page accessible for you. Users who need accessibility assistance can also contact Susan Alfano, Quality Assurance Manager at 863.733.4242 or Salfano@ridecitrus.com. Our Website will be reviewed and tested on an ongoing basis, utilizing assistive technologies by users who have knowledge of and depend on the performance of these technologies.